Chocolate cake anyone? Ben found himself a great slice! Tonight my first vegan friend (and spiritual mentor) John Oliver was in town and took me to Candle Cafe on the Upper East Side. Afterwards, we went to Gobo for dessert. Believe it or not, this was my first time at Gobo. EVER! Where have I BEEN?!?!?!? The atmosphere was the first thing that jumped out at me. Everything is beautifully wide open. 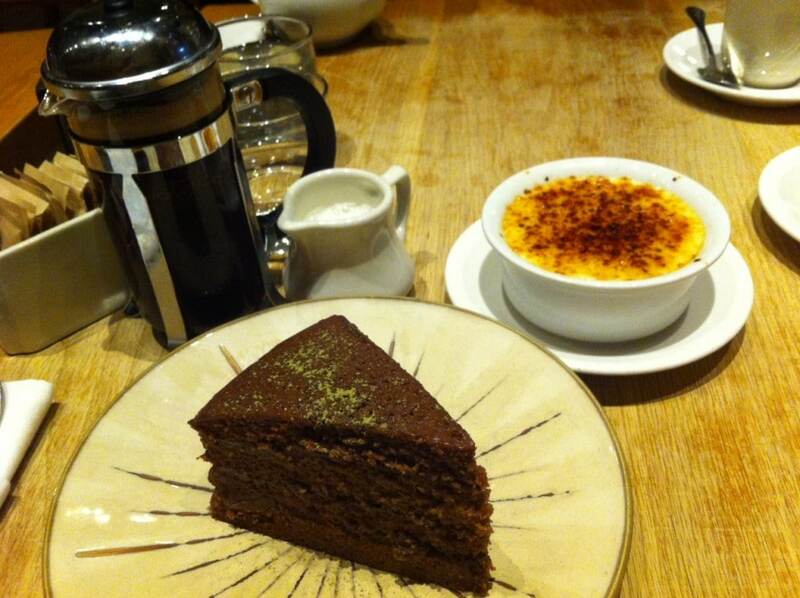 I had a small french press pot of really strong coffee, and a multilayer chocolate cake dusted with green tea. I can STILL remember the exact taste of this SCRUMPTIOUS concoction, and I even remember how it felt on my tongue. Light, moist and delicate! John had a Passion Fruit Crème Brulee with tofu cream & coconut milk — but sadly I did not get a chance to taste his (nor did I offer to share mine). I’ve got to come back to this place some time and sample their menu! We hope you do Ben! We want to hear all about it on BFVR! I want that cake! I feel like I’ve been to every vegan restaurant EXCEPT for Gobo.